When we last left our heroes, they were suffering from the throes of awful owl luck. In fact, apart from an unexpected bounty of Rusty Blackbirds and my first Brown Creeper of the year, the morning’s birding had been a bust. That this unprecedented assemblage of the three principals of 10,000 Birds should go unattended by awesome avifauna was intolerable. That’s right, this was the first time Charlie, Corey, and I ever met as a group. In fact, this was the first time Charlie and Corey ever actually met offline! We had high hopes for such a momentous occasion, big plans that involved rarities and life birds all around. Yet our hopes were dashed by the first significant snowfall NYC has suffered in years! Fortunately, none of our mothers, bless their souls, raised us to be quitters. The birding around most of New York may have been pointless, uncomfortable, and possibly deadly but we had an ace up our sleeve – Long Island. Just as the broad expanse of Atlantic coastline moderates the severity of winter snows on the island, so does such inclement weather mitigate the typically horrendous traffic conditions on area highways. Faced with such an unlikely win-win situation, we struck out for Jones Beach. Charlie and I did pretty well at Jones Beach last winter, bagging the bird that Corey cannot bear to even discuss. Then again, Corey has unearthed some exceptional treasures there himself. However, it should be said that we’ve never visited the beach in a storm that vacillated from snow to sleet depending on which form of precipitation would be more of an inconvenience. The Coast Guard Station, usually a haven for all manner of loons and seaducks, hosted some unflappable Red-breasted Mergansers, Black-bellied Plovers, Mallards, and a smattering of commonplace gulls. We spied a passing Long-tailed Ducks and Brant out at the edge of our optics but weren’t foolish enough to expose a scope to such injurious weather conditions. 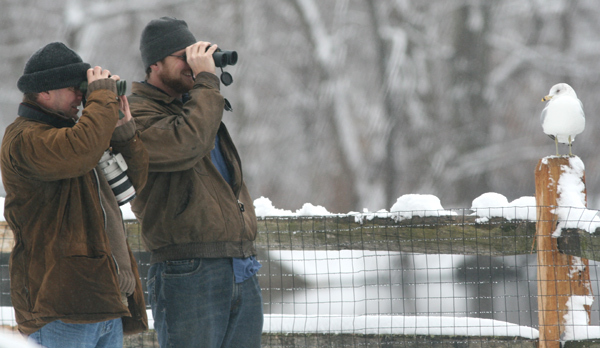 The loop around to the Roosevelt Nature Center was unusually birdless. Usually, raptors, sparrows, and mockingbirds occupy every thicket and branch. Today, the place was desolate. Song, Tree, and Savannah Sparrows, that last one new for the day, turned up around the nature center. We also encountered a bunch of House Finches, Yellow-rumped Warblers, and Red-winged Blackbirds, but if you’re at all familiar with northeast U.S. avifauna, you probably realized that we didn’t drive all the way out to the beach in the middle of a snowstorm for those species. We came for the winter specialties but almost left without them. It took ten minutes of tramping about to find a single Horned Lark, a gorgeous bird usually quite plentiful this time of year. Five or ten more minutes were required to finally spot a wheeling, whirling flock of Snow Buntings, finally entering the white plumage that protects them so well in snow cover. Of longspurs or anything else of interest, we found none, but at least our efforts where rewarded by crippling views of the most confiding lark I’ve ever encountered. 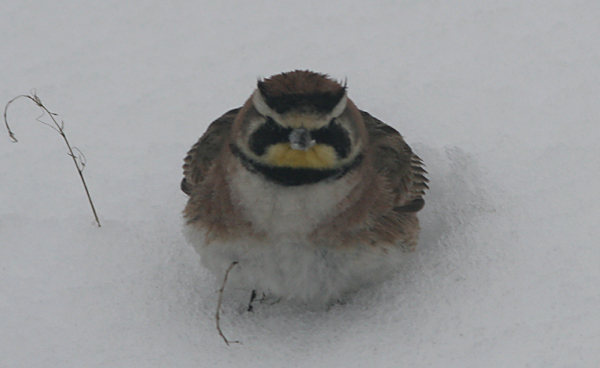 The old showtune exhorts the worn and weary to, and I quote, “Brush off the clouds and cheer up, put on a happy face.” This lark, with its cheery yellow face and strong black markings, reminded me for all the world like the classic smiley face. Suddenly, things were looking up for our heroes! Our time together was nearing an end so we made one last-ditch effort for quality birds. After all, Charlie is rocking a ridiculous Big Year and Corey and I would be damned if we weren’t going to help our partner pad his year list. The pond adjoining St. John’s Episcopal Church in Cold Spring Harbor is nothing short of revelatory as far as waterfowl are concerned. Last year, I spotted some ravishing Redheads at the pond. Were they and their extended Aythya family still around? I’m thrilled to report that they were indeed. If the Magical Grove was a dud, the “Holy Pond” as this place is sometimes called was more of a miracle. 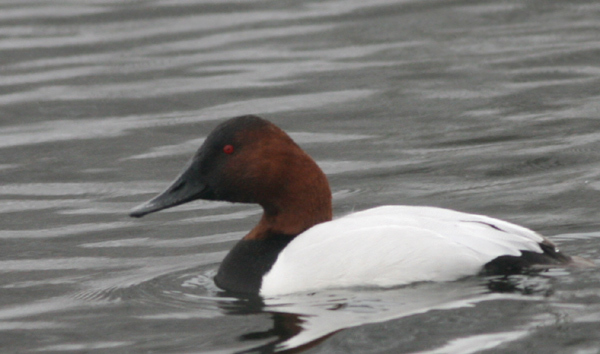 Along with the aforementioned Redheads, the pond sheltered Canvasback, Ring-necked Duck, and Lesser Scaup along with Mallards, Black Ducks, American Wigeons, Ruddy Ducks, Wood Ducks, Gadwalls, Hooded Mergansers, American Coots, Canada Geese, and Mute Swans. At last, birding success! Mike, I’m glad I read this post! My cousin and I drove out to St. John’s church to see the ducks as your list contained a number I haven’t yet seen. It’s a beautiful spot and I did get to see the scaups, canvasbacks, grebes, etc. To top off the day, I saw my very first Eastern Bluebird in the brush next to the parking lot. I was just getting into my car when I saw some movement. Expecting sparrows, I was totally elated to see the bluebirds. Thanks for the unintentional great tip!